In my last post I set out the official Government account of the events in the Skripal Case. Here I examine the credibility of this story. Next week I shall look at alternative explanations. 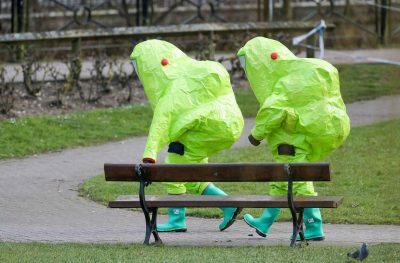 Russia has a decade long secret programme of producing and stockpiling novichok nerve agents. It also has been training agents in secret assassination techniques, and British intelligence has a copy of the Russian training manual, which includes instruction on painting nerve agent on doorknobs. The only backing for this statement by Boris Johnson is alleged “intelligence”, and unfortunately the “intelligence” about Russia’s secret novichok programme comes from exactly the same people who brought you the intelligence about Saddam Hussein’s WMD programme, proven liars. Furthermore, the question arises why Britain has been sitting on this intelligence for a decade and doing nothing about it, including not telling the OPCW inspectors who certified Russia’s chemical weapons stocks as dismantled. If Russia really has a professional novichok assassin training programme, why was the assassination so badly botched? Surely in a decade of development they would have discovered that the alleged method of gel on doorknob did not work? And where is the training manual which Boris Johnson claimed to possess? Having told the world – including Russia -the UK has it, what is stopping the UK from producing it, with marks that could identify the specific copy erased? The Russians chose to use this assassination programme to target Sergei Skripal, a double agent who had been released from jail in Russia some eight years previously. It seems remarkable that the chosen target of an attempt that would blow the existence of a secret weapon and end the cover of a decade long programme, should be nobody more prominent than a middle ranking double agent who the Russians let out of jail years ago. If they wanted him dead they could have killed him then. Furthermore the attack on him would undermine all future possible spy swaps. Putin therefore, on this reading, was willing to sacrifice both the secrecy of the novichok programme and the spy swap card just to attack Sergei Skripal. That seems highly improbable. The nub of the British government’s approach has been the shocking willingness of the corporate and state media to parrot repeatedly the lie that the nerve agent was Russian made, even after Porton Down said they could not tell where it was made and the OPCW confirmed that finding. In fact, while the Soviet Union did develop the “novichok” class of nerve agents, the programme involved scientists from all over the Soviet Union, especially Ukraine, Armenia and Georgia, as I myself learnt when I visited the newly decommissioned Nukus testing facility in Uzbekistan in 2002. Furthermore, it was the USA who decommissioned the facility and removed equipment back to the United States. At least two key scientists from the programme moved to the United States. Formulae for several novichok have been published for over a decade. The USA, UK and Iran have definitely synthesised a number of novichok formulae and almost certainly others have done so too. Dozens of states have the ability to produce novichok, as do many sophisticated non-state actors. As for motive, the Russian motive might be revenge, but whether that really outweighs the international opprobrium incurred just ahead of the World Cup, in which so much prestige has been invested, is unclear. What is certainly untrue is that only Russia has a motive. The obvious motive is to attempt to blame and discredit Russia. Those who might wish to do this include Ukraine and Georgia, with both of which Russia is in territorial dispute, and those states and jihadist groups with which Russia is in conflict in Syria. The NATO military industrial complex also obviously has a plain motive for fueling tension with Russia. There is of course the possibility that Skripal was attacked by a private gangster interest with which he was in conflict, or that the attack was linked to Skripal’s MI6 handler Pablo Miller’s work on the Orbis/Steele Russiagate dossier on Donald Trump. Plainly, the British governments statements that only Russia had the means and only Russia had the motive, are massive lies on both counts. The Russians had been tapping the phone of Yulia Skripal. They decided to attack Sergei Skripal while his daughter was visiting from Moscow. In an effort to shore up the government narrative, at the time of the Amesbury attack the security services put out through Pablo Miller’s long term friend, the BBC’s Mark Urban, that the Russians “may have been” tapping Yulia Skripal’s phone, and the claim that this was strong evidence that the Russians had indeed been behind the attack. But think this through. If that were true, then the Russians deliberately attacked at a time when Yulia was in the UK rather than when Sergei was alone. Yet no motive has been adduced for an attack on Yulia or why they would attack while Yulia was visiting – they could have painted his doorknob with less fear of discovery anytime he was alone. Furthermore, it is pretty natural that Russian intelligence would tap the phone of Yulia, and of Sergei if they could. The family of double agents are normal targets. I have no doubt in the least, from decades of experience as a British diplomat, that GCHQ have been tapping Yulia’s phone. Indeed, if tapping of phones is seriously put forward as evidence of intent to murder, the British government must be very murderous indeed. Their trained assassin(s) painted a novichok on the doorknob of the Skripal house in the suburbs of Salisbury. Either before or after the attack, they entered a public place in the centre of Salisbury and left a sealed container of the novichok there. The incompetence of the assassination beggars belief when compared to British claims of a long term production and training programme. The Russians built the heart of the International Space Station. They can kill an old bloke in Salisbury. Why did the Russians not know that the dose from the door handle was not fatal? Why would trained assassins leave crucial evidence lying around in a public place in Salisbury? Why would they be conducting any part of the operation with the novichok in a public area in central Salisbury? Why did nobody see them painting the doorknob? This must have involved wearing protective gear, which would look out of place in a Salisbury suburb. With Skripal being resettled by MI6, and a former intelligence officer himself, it beggars belief that MI6 did not fit, as standard, some basic security including a security camera on his house. Why did they both touch the outside doorknob in exiting and closing the door? Why did the novichok act so very slowly, with evidently no feeling of ill health for at least five hours, and then how did it strike both down absolutely simultaneously, so that neither can call for help, despite their being different sexes, weights, ages, metabolisms and receiving random completely uncontrolled doses. The odds of that happening are virtually nil. And why was the nerve agent ultimately ineffective? Detective Sergeant Bailey attended the Skripal house and was also poisoned by the doorknob, but more lightly. None of the other police who attended the house were affected. Why was the Detective Sergeant affected and nobody else who attended the house, or the scene where the Skripals were found? Why was Bailey only lightly affected by this extremely deadly substance, of which a tiny amount can kill? If the nerve agent had survived four months because it was in a sealed container, why has this sealed container now mysteriously disappeared again? If Rowley and Sturgess had direct contact straight from the container, why did they not both die quickly? Why had four months searching of Salisbury and a massive police, security service and military operation not found this container, if Rowley and Sturgess could? I am, with a few simple questions, demolishing what is the most ludicrous conspiracy theory I have ever heard – the Salisbury conspiracy theory being put forward by the British government and its corporate lackies. My next post will consider some more plausible explanations of this affair.